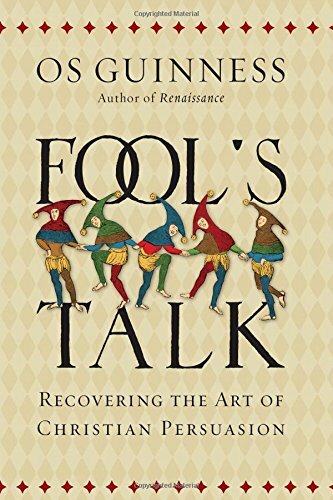 Book Review: “Fool’s Talk” by Os Guinness | J.W. Wartick -"Always Have a Reason"
Os Guinness’ Fool’s Talk is an argument for the need to change the forms of Christian persuasion used in apologetics specifically but also more generally in evangelism. Guinness critiques the way that many go about their witnessing in categories that really only make sense within contexts that are foreign to a biblical understanding and worldview. He also shines the light on how often we allow our modern concepts to distort our witness–often for the worse. There are also a number of incisive arguments against the ways that people use excuses or sinfulness to avoid the truth in witness. There are also many helpful comments on how we need to change our communication to confront the assumptions of our cultures and resonate even with those who are predisposed to disagree with us or not want to listen to the message of Christ. These include the need to confront sin, but do so in a winsome manner; to surprise listeners with a story told in a different way, and more. The book is also supremely quotable, with many excellent one-line examples that people might use to illustrate points about communication, culture, and other important topics. My main complaint with the book is that Guinness uses few practical examples to go with his critique or discerning of the styles of witnessing and engagement. The main examples used are biblical examples–surely a good way to find some effective communication!–but often these feel highly occasional rather than applicable to everyday situations. Guinness does an admirable job explaining these examples and highlighting how they were effective means of communication, but it would have been nice to have several practical applications in order to see exactly how Guinness thinks we are to change in these areas. In several sections does offer some examples of how we might better communicate, but often it seems he is more concerned with informing the readers about how communication needs to change rather than following that with exactly how change might look. Another complaint is that one of the hooks used by Guinness to start a chapter was to talk about a misogynist who successfully redirected the ire towards his position into making people think about what they were saying. It was an example that caught my attention, but using such a negative example to try to make a positive point was jarring. Fool’s Talk provides many insights into how apologetically- and evangelically-minded people can explore new avenues for witnessing. However, it does not provide many practical examples for how people might go about exploring these avenues. It’s a good starting point, but readers will need to go farther. Os Guinness, Fool’s Talk (Downers Grove, IL: InterVarsity, 2015). Thanks for this review; nice to know ahead of time about the lack of practical examples. ON that note, I did appreciate Koukl’s Tactics. Yeah, Tactics is a fantastic book with lots of excellent insight and great examples. It’s one of the main books I recommend for apologetics.